Definition of NAICS Code 561720: This industry comprises establishments primarily engaged in cleaning building interiors, interiors of transportation equipment (e.g., aircraft, rail cars, ships), and/or windows. What are some examples of this code? The bulleted items below are illustrative examples of this classification. Sandblasting building exteriors–are classified in Industry NAICS 238990, All Other Specialty Trade Contractors. 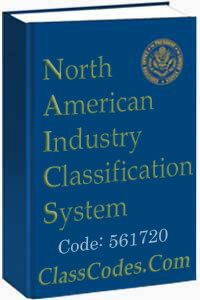 The suggested cross reference guide for NAICS code 561720 is based on our research using the resources cited above.